We offer both female-only and co-ed dorms to our guests. All of our visitors can avail of our free Internet, security lockers, the fully-equipped kitchen and lounge and our convenient smoking area. 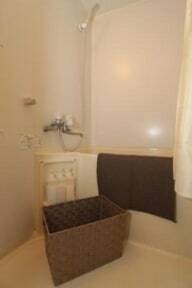 Our shared bathroom includes shampoo, conditioner, body wash, cotton balls, cotton swabs, washcloths and a hair dryer, so you can start your day off fresh. Rates include a light breakfast of bread and coffee or tea. We provide our guests with a key at check-in so you can come and go as you please; there’s no lock-out, although lights-out is at midnight. For a small fee we can also provide bath towels (Y50), car parking spaces (Y600/day), bicycle rental (Y500/day) self-service washing machine with detergent (Y200/load) and a self-service dryer (Y200/load). Parking spaces are limited so if you plan on renting a space please let us know ahead of time to reserve a spot. This was an extremely warm and cozy stay. Not only were the beds huge and comfortable, but the staff were amazing. I had great conversations with one of the owners, who did her best to make sure that I had an enjoyable stay. Whenever I had questions or requests, they were extremely helpful and accomodating. An experience that I will not forget. This hostel is very clean and has a very “homey” feel to it. Maiko-san provides a small breakfast each morning (pizza toast). The location isn’t great, but is accessible through local bus or Tozai subway. 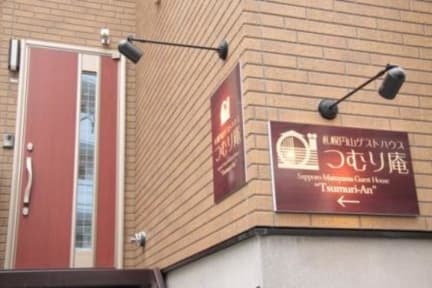 The location was fantastic, as the property itself was just a few blocks away from the Maruyama Koen station, which is only three/fours stops from any of the main stations and locations of Sapporo. The property owner was really sweet and helpful, and always left her contact info in case she wasn't around and anyone needed her. There was breakfast available and a decent sized lounge/living room type area. The beds were incredibly comfortable and the facilities were all very clean. I had a great experience at this guesthouse! The guesthouse is owned by a very sweet family, all of whom speak a little English. You feel the personal touches of the guesthouse instantly -- the decorations, the prepared breakfasts every day, and the kindness and hospitality. The guesthouse is not in the center, but it is a 5-minute walk from the metro, which is only 3 stops away from central Sapporo. I highly recommend this place! Clean and not too hard to find. Extremely helpful staff. Welcome candies & free tea adds a nice touch. It's a bit far from the station, but the directions are easy to follow. Nice atmosphere and wonderful people. I don’t like the ravens around that area. They made some noise. But good that I didn’t hear that during my sleep. Other than that, all good. The room and beds are nice, kitchen is cozy as well, but don`t do too much cooking ( twice a day) as the host will cut the electricity and gas (without warning). So, for those super-market lovers, it`s a bad news. I don`t know if it is because of the gas price or some cultural things, but it makes our stay into kinda odd experience. It never happens when you travel in any other country. Shops and restaurants nearby are expensive, so maybe you have to beg 7-11 for your food all day.